Every year since we moved to the great state of Texas, we make the annual trip to Central Market (aka Gucci Grocery) for the Hatch Festival. These green peppers are the most amazing thing. Hot or mild they have such an amazing flavor that can be used in dishes savory or sweet. Each year I buy a full case, set some aside to roast, freeze others to supply my kitchen for the rest of the year - and also use a huge pile and throw a Hatch Party. On Facebook this year, Central Market offered up a contest. 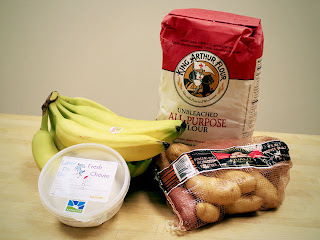 Hatch Challenge: What would you cook? Tell us! Your ingredients: Hatch Chiles, Bananas, Fingerling Potatoes, Goat Cheese, All-Purpose Flour — plus pantry staples and one “jackpot spice” of your choice. Here is my award winning submission recipe - and a new favorite all time recipe for my kitchen. Preheat the oven to 350°F. In a large bowl, mix butter into the smashed bananas and potatoes. Mix in the sugar, egg, and vanilla. Add the baking soda and salt over the mixture and mix in. Add the flour, and stir until combined. Fold in the diced hatch peppers last. Pour mixture into two buttered loaf pans. Bake for 1 hour. Remove from pan and cool. For frosting, mix the powdered sugar, butter and cheese in mixer. Slowly add milk until frosting is well blended and smooth and spreadable. Frost bread after it has cooled and sprinkle remaining Hatch peppers on top. Serve sliced to your friends and family and watch the smiles! Many thanks to Central Market for the inspiration for this truly fantastic treat!